Kilsyth's Joe Barclay (left) can't believe it as team-mate Michael McGee is red carded against Kilwinning. In football the referee is very often blamed as an excuse for a bad result by those on the wrong end of it - but in the case of Kilsyth Rangers on Saturday it was hard to avoid doing so. A series of very poor decisions undoubtedly played a major part in their 5-2 defeat at the hands on Kilwinning Rangers at Duncansfield in what could otherwise have been a very good game. It was almost an exact repeat of the result in the fairly recent Scottish tie against Camelon, and with the same referee in charge. Kilsyth made the ideal start when, only a couple of minutes in, a corner put over by Paul Nash was headed home by Chris Reid for the opening goal. But just a minute later though they were a man down when a fairly robust challenge by Michael McGee was punished with a straight red card. The decision was hotly contested by the Kilsyth management and worse was to come just five minutes later when a penalty was given against them for what appeared to be a perfectly good tackle in the box. Andy Carlin saved the spot-kick from Ben Lewis but Tommy Maitland, following up, shot the ball to the net. Despite this it was a fairly even game for most of the first half, although the ref was flashing his card for almost any minor infringement, until just a couple of minutes before half-time when Liam McGuinness received the ball in a blatantly offside position, rounded Carlin and struck home a second Kilwinning goal. Kilsyth began the second half with Damon Welsh on for Reid, who had been struggling with an injury, but within two minutes Kilwinning had scored a third goal, McGuinness adding his second of the game. The home defence was in some disarray at this point and another two goals followed in quick succession, Maitland netting again with Bryan Boylane adding a fifth. It looked like Kilwinning might run up a cricket score at this point in the game but gradually the home defence got a grip and it’s fair to say that the visitors also eased off a little. Changes were made by both teams but the heat had gone out of it and it was just a case of seeing out time from now on. Late in the game Paul McBride pulled on back with a long strike but it made no difference to the result which was never in doubt after the first-half events. 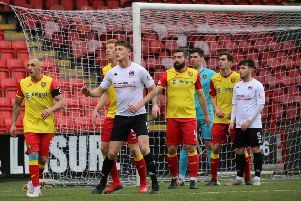 The defeat means Kilsyth have now lost four of their last five league games and a turnaround in fortune is needed if Ramgers are to maintain a top half league position. Next up is a trip to face North Lanarkshire rivals Bellshill Athletic at Rockburn Park on Saturday, kick-off 1.45pm. Kilsyth: Carlin, O’Neill, Waters, Reid, Hamilton, McGee, Nash, Pearson, Barclay, P McBride, Prentice. Kilwinning; Strain, Colmam, Fleeting, Campbell, Boyd, Maitland, Agnew, McGuinness, Boylan, Lewis, Cashmore.